The active lingual arch (LA) and the lip bumper (LB) are popular appliances used for maintaining or increasing arch length. This article highlights an innovative appliance that incorporates the LA and the LB, indicated for the simultaneous treatment of space loss and lip sucking habit. The lingual arch (LA) is a bilateral fixed space maintainer, consisting of a single heavy gauge stainless steel wire adapted anteriorly to the lingual aspect (cinguli) of the mandibular anterior teeth and posteriorly to bands on the first permanent molars. The LA prevents the mesial migration of the mandibular first molars (M1), sometimes resulting in incisor proclination. Lip bumpers (LBs) are generally indicated for the treatment of mild-to-moderate tooth size-arch length discrepancy during the mixed dentition. They function by increasing arch width (in premolar and molar areas) and arch depth (by the proclination of incisors and distal tipping of M1) of the lower arch.,,,, It is also used for eliminating lower lip sucking habit, mentalis hyperactivity, and labiomental strain. 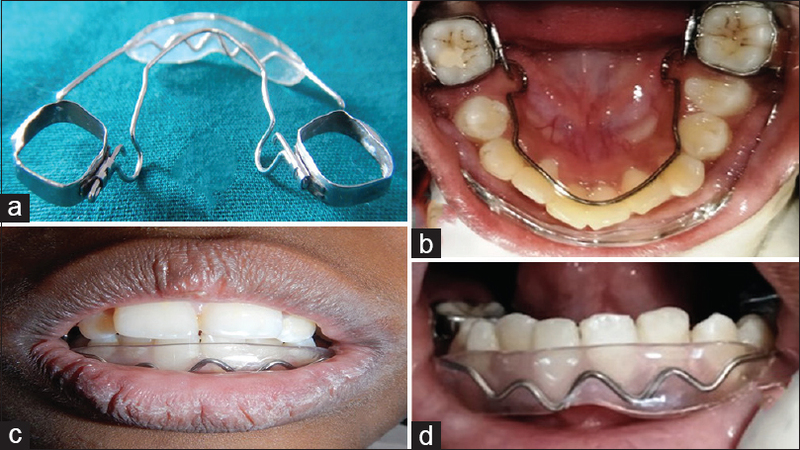 This article highlights an appliance incorporating an active LA and an LB that may be used for the simultaneous treatment of space loss in the lower arch and lip sucking habit. An 11-year-old female patient visited the Department of Pedodontics and Preventive Dentistry with the complaint of forwardly placed front teeth. The patient had normal facial form and the medical history was insignificant. Extraorally, the patient displayed lip incompetence at rest and lower lip trap, which had resulted in a lower lip sucking habit with hyperactive mentalist activity. However, mouth breathing was found to be absent on examination. On intraoral examination, protrusion of the upper and lower incisors was observed. The upper arch contained permanent teeth except the canines, while the lower arch contained permanent teeth except 45. There were no primary teeth or permanent second molars present in any of the arches. Moreover, early exfoliation of 85 had caused mesial migration of 46, which had resulted in partial loss of space for the eruption of 45 [Figure 1]. The space loss was found to be 5 mm, calculated from the mesiodistal dimension of the erupted 35. It was decided to fabricate an active LA (with omega loops) combined with an LB [Figure 2]a, in order to distalize the M1 and to treat the lower lip sucking habit simultaneously. The patient and her parents were informed about her condition and an informed consent was obtained for undertaking treatment. Band adaptations were done on the lower M1 and alginate impressions were made. On the lower cast obtained, a removable active LA (0.9 mm wire thickness) was constructed that inserted into lingual sheaths welded on to the lingual side of the M1 bands [Figure 2]b. 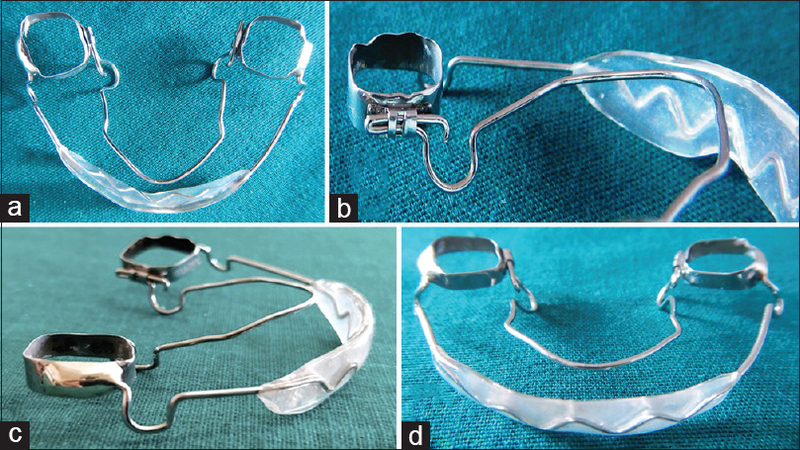 An active LB with loops was also constructed and soldered to the buccal aspect of the M1 bands [Figure 2]c. The LB contained an acrylic shield about 1 cm in width, fabricated over the anterior “zig-zag” segment of the LB wire [Figure 2]d and [Figure 3]a. The acrylic shield was fabricated such that it was positioned anteriorly away from the labial surface of the lower incisors, centered over their gingival margins. The appliance was checked thoroughly for any defects before it was polished. On the next appointment, the appliance was cemented after a trial fit evaluation [Figure 3]b, [Figure 3]c, [Figure 3]d. The patient was recalled the next day to check for any complaints. The patient has been put on a 4th weekly activation schedule, until the desired distalization of M1 and elimination of the lip sucking habit is achieved. There are many factors in literature that are known to contribute to mandibular second molar (M2) impaction or ectopia, secondary to LB treatment: (a) angulation between M1 and M2 exceeding 20°,,, (b) presence of lower anterior crowding,, (c) deficient space in the molar region, (d) M1 is close to the anterior border of the ramus,, (e) M2 is mesially tipped during root formation,, (f) the mesial root of M2 is shorter than the distal root,, and (g) ill-fitting M1 bands. However, none of the above factors were evident in this case as per radiographic evaluation. The frequency of M2 impaction or ectopia in untreated individuals has been found to be 0.1%–2.5%.,, Ferro et al. found that 7% and 16% of the M2 underwent impaction and ectopia, respectively, following LB treatment during the mixed dentition. Moreover, Jacob et al. found M2 impaction in 12% of the patients who underwent LB treatment. However, even if the risk of M2 impaction develops in this case, it can be treated by placing spacers between M1 and M2 to create space, thus allowing the second molars to achieve a favorable position. The shield of the LB is positioned at a distance anterior to the lower incisors, which gets activated due to pressure from the lower lip. Since the LB keeps the lower lip and buccal musculature away from teeth, the change in force equilibrium results in buccal movement of posterior teeth.,, There are different levels of positioning the LB: (a) incisal edge, (b) middle third of crown, and (c) gingival and subgingival levels. In this case, the acrylic shield of the LB was centered over the gingival margin of the incisors to help in molar distalization. Although smaller shields (wire covered with shrink tubing) may be fabricated, an acrylic shield of 1 cm width (canine to canine) was fabricated to exert a larger distalizing force on the M1., In this case, treatment was undertaken when the development of M2 could be classified as Nolla's stage 7. However, it has been found that the developmental positions of M2 do not affect LB treatment results. The innovative appliance incorporating an LA and an LB is an efficient design, if the simultaneous treatment of space loss and lip sucking habit is indicated. A simultaneous approach reduces the duration of treatment and improves patient compliance. Laing E, Ashley P, Naini FB, Gill DS. Space maintenance. Int J Paediatr Dent 2009;19:155-62. Villalobos FJ, Sinha PK, Nanda RS. Longitudinal assessment of vertical and sagittal control in the mandibular arch by the mandibular fixed lingual arch. Am J Orthod Dentofacial Orthop 2000;118:366-70. Letti HC, Rizzatto SM, de Menezes LM, Reale CS, de Lima EM, Martinelli FL, et al. Sagittal changes in lower incisors by the use of lingual arch. Dental Press J Orthod 2013;18:29-34. Jacob HB, LeMert S, Alexander RG, Buschang PH. Second molar impaction associated with lip bumper therapy. Dental Press J Orthod 2014;19:99-104. Nevant CT, Buschang PH, Alexander RG, Steffen JM. Lip bumper therapy for gaining arch length. Am J Orthod Dentofacial Orthop 1991;100:330-6. Davidovitch M, McInnis D, Lindauer SJ. The effects of lip bumper therapy in the mixed dentition. Am J Orthod Dentofacial Orthop 1997;111:52-8. Werner SP, Shivapuja PK, Harris EF. Skeletodental changes in the adolescent accruing from use of the lip bumper. Angle Orthod 1994;64:13-20. Grossen J, Ingervall B. The effect of a lip bumper on lower dental arch dimensions and tooth positions. Eur J Orthod 1995;17:129-34. Germeç D, Taner TU. Lower lip sucking habit treated with a lip bumper appliance. Angle Orthod 2005;75:1071-6. Di Luzio C, Bellisario A, Giovannoni D, Caputo M. Second molar impaction with lip bumper therapy. Web Med Cent Orthod 2017;8:WMC005410. Ferro F, Funiciello G, Perillo L, Chiodini P. Mandibular lip bumper treatment and second molar eruption disturbances. Am J Orthod Dentofacial Orthop 2011;139:622-7. 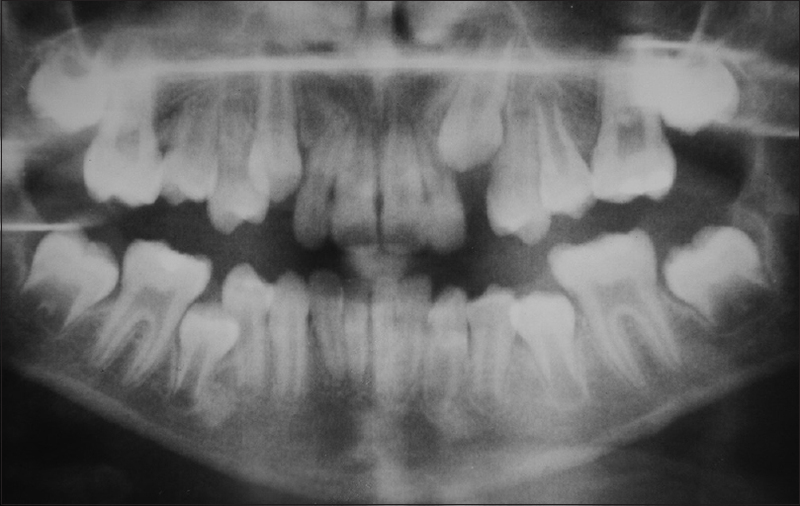 Evans R. Incidence of lower second permanent molar impaction. Br J Orthod 1988;15:199-203. Varpio M, Wellfelt B. Disturbed eruption of the lower second molar: Clinical appearance, prevalence, and etiology. ASDC J Dent Child 1988;55:114-8. Shapira Y, Finkelstein T, Shpack N, Lai YH, Kuftinec MM, Vardimon A, et al. Mandibular second molar impaction. Part I: Genetic traits and characteristics. Am J Orthod Dentofacial Orthop 2011;140:32-7.